Best Self Productions: SO- You're thinking of trying out INTERMITTENT FASTING?! Awesome! SO- You're thinking of trying out INTERMITTENT FASTING?! Awesome! There seems to be a recent flood of people interested in the "intermittent fasting" approach to a healthy, balanced nutrition plan... and, as with any new plan that comes around, there are a lot of questions about it! About 2 years ago I started to really explore how to become a fat burning machine as opposed to a carb fueled monster, and I today I want to set out a little bit of what I learned in the process for you! The most important piece for you to understand about intermittent fasting is that it is NOT a quick fix solution to your weight loss goals. If you are looking for a way to drop weight FAST, this post isn't for you. This approach isn't for you. If you're looking for a way to truly optimize your health for LIFE, then keep reading. There are many ways to become more fat adapted, and intermittent fasting is just one potential piece to that puzzle. You MUST listen to your body as you begin to experiment. What works for one person may not work for you, and what might work great for you might not work for someone else. Resist the temptation to compare yourself to others. Your genetics, hormones, current habits, and so many other lifestyle factors all come together when it comes to your journey to becoming your best self. These are all major players that require time, energy, and patience to reprogram themselves in order to function at their best. Intermittent fasting, while INCREDIBLE in so many ways, will take time for your body to adjust to fully and will not necessarily give you dramatic results in 2 weeks. Your body is complex. BE PATIENT and STAY THE COURSE. Deal? Okay. 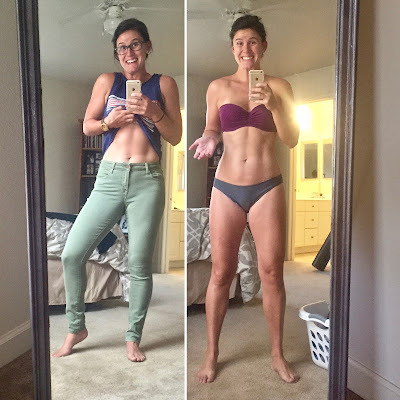 SO.... when I decided to take the plunge, I lightly documented my journey as far as the WHY I decided to dive into IF, HOW I approached condensing my eating window, and WHAT some of the expected and unexpected side effects were as I progressed through my first month with it. I've put them together in a little list here for you to check out! 2. You can find my 1st week's response and how I felt physically, emotionally, and some unexpected (yet apparently very common) side effects that cropped up as my body adjusted, here: A Tardy Update on My New Nutrition! I proceeded to have the best, healthiest, most fulfilling running season on the books. I ran a half marathon and a couple full marathons during this year of practicing IF with ZERO intestinal distress, no injuries, and feeling more energized and clear headed than ever before. My sleep schedule was SOLID and I woke up refreshed every single day. I never had a moment of hangry-ness, and experienced more stable blood sugar levels than ever before in my life. I was less fluffy, leaner, and felt more like my BEST self than I had felt in a long time! I even went so far as doing 10-12 mile fasted runs during my training season and feeling great! So, if you were to ask me if I think you should give IF a try for yourself, my answer would HAVE TO BE a resounding YES! As long as you also: listen to your body, keep your blinders on to others, and are willing to be patient as you fundamentally shift the way in which your body has been functioning (probably for decades). Lifestyle coach: striving for fulfillment, spreading joy, sharing love, and inviting you to join this journey as we become our healthiest and happiest selves!